Hotel Recreation Center Shepilska is situated on Urochische Shepil'ske 1 in Morshin only in 22.5 km from the centre. The services offered to guests may include: you may order food and drinks into the room, tennis court, evening entertainment, free parking space, jungle gym, pleasant bar, finnish sauna, express shuttle service(additional charge), Wifi available in all areas. Staff talks in Ukrainian, Russian, Italian. Bright room with bedside tables. There is no capacity for extra beds. Bright room with a TV and a balcony overlooking the lake. There is no capacity for extra beds. Bright suite with a TV. This suite features slippers in the bathroom. Bright suite with a TV and a sofa. This suite features a furnished balcony. Spacious cottage with a kitchen and a terrace. This cottage features barbecue facilities and a private parking. Spacious cottage with a kitchenette and a terrace. 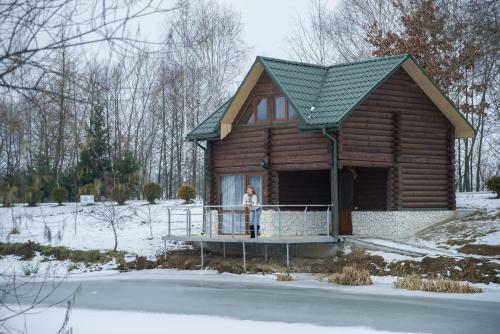 This cottage features a private access to the lake. Spacious cottage with a kitchenette and a terrace. This suite features satellite TV and a fridge. It also has a living room with a seating area. Guests use the private bathroom that includes free toiletries, slippers, bathrobes and a hairdryer. This holiday home has a seating area, electric kettle and sofa. Children and Extra Bed Policy All children are welcome. One child under 6 years stays free of charge when using existing beds. All children under 2 years stay free of charge for children's cots/cribs. All children under 12 years are charged UAH 120 per night for extra beds. All further older children or adults are charged UAH 220 per night for extra beds. The maximum number of extra beds in a room is 1.